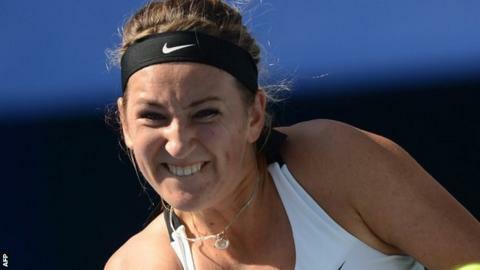 Victoria Azarenka and Maria Sharapova are on course to meet in the final of the China Open after they both reached the last four. World number one Azarenka needed just 55 minutes to beat world number 69 Romina Oprandi 6-2 6-0. Sharapova was on court two minutes less as she overcame Angelique Kerber, who was forced to retire at 6-0 3-0. In the men's draw Jo-Wilfried Tsonga and world number two Novak Djokovic are through to the last four. Tsonga, 27, beat Mikhail Youzhny in straight sets 6-3 6-2 and will now face Feliciano Lopez in the semi-final after the Spaniard beat Sam Querrey 4-6 6-4 6-4. Djokovic, who is heading for his third successive tournament win in China, raced to a 6-1 6-2 win over Austrian Jurgen Melzer. The number one seed won in just 53 minutes and hit 12 aces - four of which came in a single game. "I think that's the first time," Djokovic said of his four-in-a-row. "It was one of the best serving matches I have had in my career." Djokovic will face Florian Mayer for a place in the final after the world number 29 beat Zhang Ze of China 6-3 6-4. Azarenka will take on world number 10 Marion Bartoli in the women's draw, after she beat Carla Suarez Navarro 6-0 2-6 6-4, while Sharapova will meet Li Na for a place in the final. Na, the home favourite, beat Agnieszka Radwanska of Poland 6-4 6-2. In the men's doubles, British pair Colin Fleming and Ross Hutchins reached the semi-finals with a 6-7 6-2 10-5 win over Sweden's Robert Lindstedt and Romania's Horia Tecau.